Jemma and I have both fallen in love with fruit leather! It tastes like dessert, but is packed full of fresh fruit. What better way to welcome spring/summer when it is still pouring rain outside … a blast of yummy fruit in our mouth! Add softened fruit into blender and blend until smooth. Taste for flavor. If you think it needs a boost of sweet, add a little honey or sugar. Line a 9×13 cookie sheet with parchment and evenly spread puree to edges with spatula. Heat oven to 150-170 degrees (depending on how low your oven goes) and bake for 6 hours. Even though the oven is on, you need to prop the door open a crack to allow moisture to escape. When the leather is no longer moist to the touch – it’s done! Peel off the parchment and cut into strips – I found that a pizza cutter works great for bite size squares or strips. The above photo is our raspberry leather which is why it looks a little bumpy in the final product, not all the seeds blended perfectly. Next up is a batch of apple cinnamon leather! This is awesome!! About how long does the fruit leather stay fresh? Can't wait to try this!! Ours is still good after a month – I've just kept it in a ziploc. We've tried apple/mango/carrot fruit leather. It tasted delicious but Hunter wasn't a fan of the texture. If you toss some steamed carrots into your next batch of apple cinnamon puree, that'll give you some extra veggie goodness! Yes! Another way to sneak in veggies!!! I am so trying this… yum! Ooooh, apple cinnamon sounds good. I cant believe how easy this is to make, thanks for sharing! 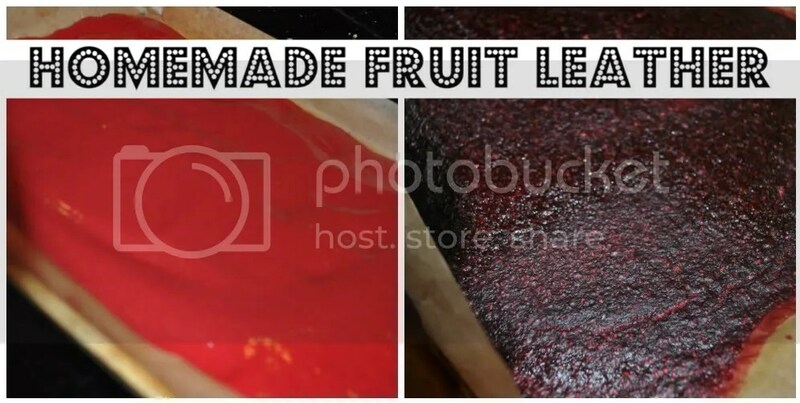 I had no idea fruit leather was so easy! That is incredibly cool. I'm going to let my resident cook (Sam) know about this pronto. Wow – that is so easy! I had no idea. We'll definitely be trying this. Pinning your post! Mmmm…. I'm so going to make these. I bet it would be a breeze with my Vitamix. I wonder if they freeze well. It could be another way to preserve my strawberries this summer. I was going to try these but some people have said it sticks to parchment paper. Have you used parchment and did you have a problem with sticking? That sounds simple enough, I'm not sure why I haven't tried it yet. Looks delicious and I know the kids would gobble it up. Thanks for sharing this with the NPN blog hop!